Temporary fabric markers have a very useful place for hand sewing projects and felt crafts. Use them to mark out patterns for tracing around and cutting as well as for marking embroidery and stitch lines. Discover what fabric markers are best, particularly for hand stitching and felt sewing crafts. There are many different marking tools available to choose from but not all of them work brilliantly with felt. This handy guide will run you through which fabric marking tool is best to use with your particular felt craft and how to use them. If you start doing a lot of sewing with felt, chances are you'll soon need to learn about temporary fabric marking tools. You need these for tracing around plush patterns for cutting and sewing, for drawing on temporary lines for stitching and embroidery and a lot more. Here's what you need to know. There are a number of easy to use fabric marking tools to buy that will make temporary marks on your fabric. However, not all of these work quite so well with felt fabric. The main marking tools for felt include variations of pens as well as Tailor's chalk. They both have good points and bad. And, in this case, there isn't a "one size fits all" product. Erasable fabric marking pens are a favorite choice of sewing tool for me. I mainly use them to transfer patterns on to felt and fabric. Because these erasable fabric marking pens come with a fine nib, they are a pretty accurate way of tracing around patterns, inside stencils and for drawing freehand designs for stitching and embroidery. The pens are readily available, inexpensive to buy and easy to use. Erasable fabric marking pens are an absolute essential in my sewing tool kit. They are as easy to use as normal pens and I love the accuracy that you get with the fine nibs. They even work well on felt which is a rather odd material to draw on because of its fuzzy, matted texture. There are a number of different types of erasable fabric marking pens but I prefer the water soluble marking pens which normally come with a medium blue ink. The color of ink is easy to see on most light-medium shades of felt and fabric. ⭐ The major downside with the water soluble kind is that you have to physically remember to remove the ink marks when you no longer want them there. However, the plus point is that the marks will stay there until you are ready to remove them - something that cannot always be said of the air erasable kind. The water soluble fabric markers need you to remove the ink marks when you no longer need them. As the name suggests, the ink comes off with a small amount of water. I normally dip a very fine paint brush into water and dab the ink off that way. Some of these pens come with an erasable nib at the other end to the pen which removes the ink when you draw over it. There are other temporary fabric marking pens that work in a similar fashion. The main ones involve removing marks with either heat or air. 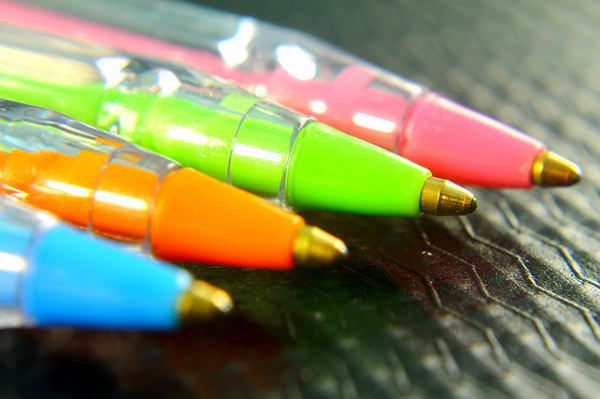 The air erasable pens (sometimes known as disappearing ink) often come in shades of purple or pink. The idea is that the markings are supposed to disappear naturally over a number of days though I often read complaints that the marks vanish much sooner. You also get combination pens which are both air and water soluble. So the marks will eventually disappear naturally but you also can choose to remove them sooner with water. I like to use my mini DIY tabletop ironing board for most of my craft projects. The last main kind of pen is a heat erasable fabric marking pen. On this kind, the marks come off after applying heat. For instance by ironing over the top. With felt, you need to use a warm rather than hot iron since this material can react badly to high heat. Then place a barrier of fabric (cotton is ideal) between the felt and the iron. Turn the steam function off and iron over the top to remove the marks. Adjust the heat setting by small increments if necessary. ⭐ Do not use heat erasable pens that are not designed for fabric like Frixion. If they haven't actually been designed or approved to use on fabric, you can get wildly unpredictable results. I've read a number of horror stories where crafts have been totally ruined when previously removed marks come back again and stick around permanently. The temporary marking pens are really great. I keep a big stash of them to use for all kinds of sewing projects but unfortunately they are not a complete solution for fabric marking and especially not with felt. There is one main downside with most erasable fabric marking pens. They simply do not work well on dark colored felt. Shades and colors like black, navy blue and dark purple are very hard to mark with pens because you can’t see the lines very well - if at all. 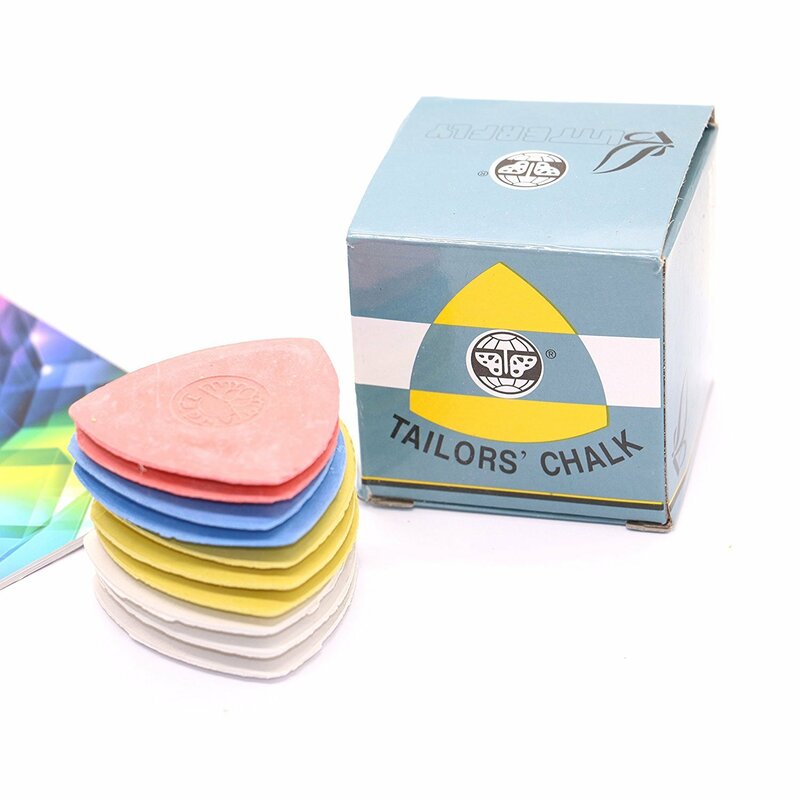 There is a product that can work well with dark felt colors and this is Tailor's chalk. This is a tool that is traditionally used by dressmakers and garment sewers. Tailor's chalk has been around for years and normally comes shaped as simple squares or triangles of chalk. It is often made from light colors like white, yellow and pink as well as medium shades like blue. These chalks can make marks that show up pretty well on felt. I would only use them where it is impossible to use the erasable fabric marking pens because the triangles make fairly thick lines. The lines can show up well but are less accurate due to the thickness. And sometimes the chalk can be hard to rub off too. The chalks are nice and easy to use but you sometimes need to press hard or work back and forth across the felt to make a line that stands out. The markings are not as accurate as pens when tracing because of the thicker lines. And the chalk dust can also rub off onto your hands and your clothes. There are many modern variations of Tailor's chalk such as pencils and also pen style markers which are both easier to hold and ensure that your hands stay clean. For marking finer lines than the traditional triangles can, there are chalk pencils and also chalk liners for using on fabric and felt. Clover Chaco chalk liners are pen style holders which come ready filled with powdered chalk. The powdered chalk is dispensed from the nib area when you press over the fabric. 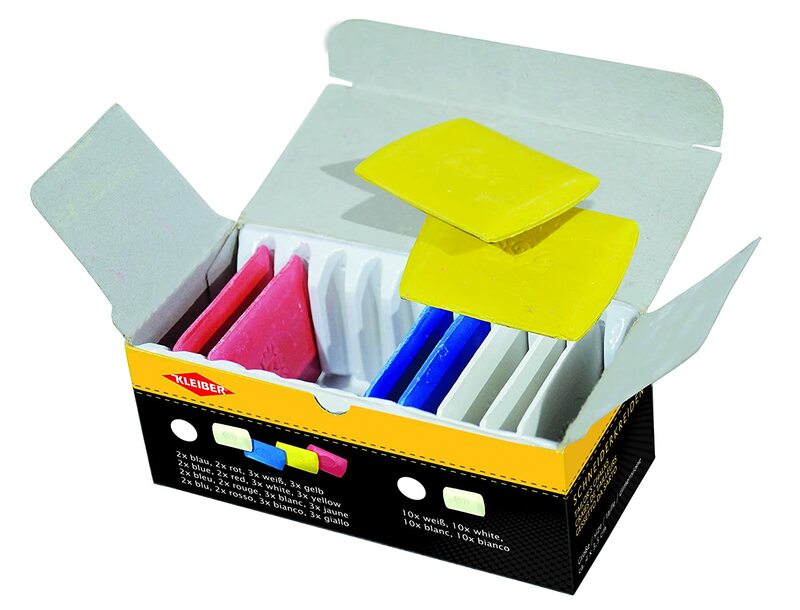 The chalk liners come in a very good range of colors such as white, yellow, blue, pink and silver. The colors are especially useful for marking on those dark felt shades and colors like black. Chalks devised as pencils and pens mean that you are able to make slightly more accurate marks and also keep your hands clean. However, being a powder, the chalk markings are never likely to be as accurate as that of a pen. The marks from the chalk can also be a bit of a nuisance to remove so I don't recommend pressing any harder than you need to. Although, in most cases, it is normally best to use actual fabric markers designed for the job, you can also choose to use regular pens instead. Standard pens and markers will leave permanent lines on the felt which you can hide on the reverse, sew over or cut off. Regular marker pens, Sharpies and felt tips can all make permanent marks on felt fabric. They are worth testing out if you want to draw, color or write on the felt but I don't recommend them for pattern marking. I've tested a lot of types and most of them will either bleed ink out into the felt, smudge and smear across the fabric or make rather thick and unattractive lines. ⭐ Ballpoint pens, however, are worth testing out. In the past, I've often used a ballpoint pen to trace around a pattern template on the reverse side of the felt. So long as you mark the reverse or you plan to cut the marks off by cutting just inside the lines, ballpoint pens can work pretty well on both acrylic and wool blend felts. I love that they make a nice fine line. It is even possible to use ballpoint pens for embroidery and stitch markings, if you know that your stitches will completely cover all the lines. With permanent markers, I would always advise testing them on a spare piece of felt to see how well they work. There are so many different brands and types of pens on the market and each one may react differently when used on this material. Some bleed into the felt, some smudge easily, some just don't make very good marks. So always test first. When you have decided on what fabric marker you're going to use, then you can begin to draw out patterns. You can draw your own patterns, trace around cut patterns, draw embroidery lines and even use stencils to make easy designs to cut and stitch. For tracing around felt and plush patterns, place the pattern piece on top of the felt and hold it firmly down with one hand while you trace around it with the other. Where possible, I prefer to mark on the reverse side of the felt. Unless it has a printed pattern, felt is usually exactly the same on both sides. So what I mean by the reverse side involves turning the pattern piece upside down and then tracing around it. Tracing around the pattern with it upside down means that the pen mark will be over on the back of the pattern piece and (when you turn it over) the front will have no visible mark. While it is normally easier to make visible marks on your felt that you can use as guides for cutting or sewing, sometimes it is possible not to mark your felt at all. There are a number of mark-free methods and techniques that you can try instead. For cutting around simple pattern pieces, it is possible to simply hold a template firmly on top of the felt and then cut around it carefully. As long as you can hold the template steady and the felt does not slip, it is a very simple and quick method. The bonus being that there are no unsightly lines. Rotary cutters have a circular blade wheel which slices through the fabric. Use it freehand or around templates. Using a rotary cutter and a self-healing cutting mat, you can also cut straight through felt. You can buy quilting rulers and templates designed to be used with rotary cutters. Simply place your felt down on the mat, place a template or ruler on top and run the rotary cutter firmly and steadily down the side to cut into the fabric. Rotary cutters can take a while to get used to but you can quickly cut out pieces of felt and have no unsightly marks to remove afterwards. There are many quilting templates that you can use to cut around that you could adapt for your felt crafts as well. Another method is to pin paper patterns onto your felt and then cut right through them and the fabric in one swift go. You can use scissors or a rotary cutter if you are confident with this cutting tool. This is a great technique because it is fairly quick and easy and leaves no markings behind on the felt. However, it can blunt your scissor blades quicker if you cut through the paper pattern instead of around it. No-marking methods for embroidery on your felt is a little harder to achieve. I can work small and simple designs on the fabric by visualizing where I want the stitches to go. For more complex designs, I'd normally draw them out with a suitable erasable pen and sew over the top before removing the marks. There is another way which involves tracing your embroidery pattern onto some thin tissue paper. Then you place this over your felt and sew right through it, following the pattern lines. After you've finished, you carefully tear the paper away. You may need to use tweezers to pick out stubborn pieces of tissue that remain. What fabric markers are best for felt sewing really depends on what methods you're comfortable using and what works best for your particular project. Test out a few of the methods I've outlined here and see what works for you.